Nokia Charging Stations List : Where to Charge your Cellphone When you're Out? 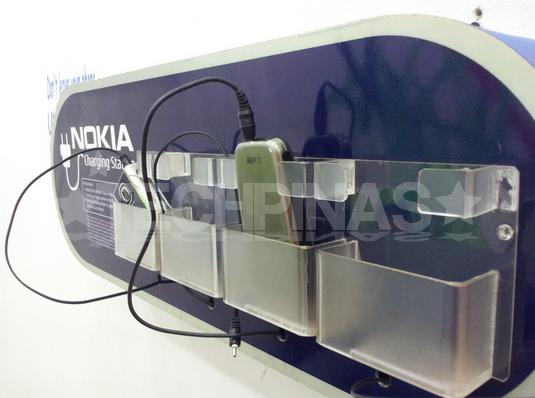 "We’ve just refurbished majority of our charging stations to allow Nokia users the convenience of charging their handsets for free at places they can trust and feel more secure in," shares Ms. Nikka Abes, Corporate Communications Manager, Nokia Philippines. According to the press release, which I got last week, "Through these charging stations, Nokia once again proves that it is a reliable brand not only because of its user-friendly, affordable and stylish products. Nokia, the brand Filipinos trust and love, also provides premium services and innovations to its millions of users nationwide." But really, every time I see these free charging docks, I'm just reminded of how much Nokia and the people behind the brand care for their consumers. It's a simple gesture, really (nothing too grand about it) - but I believe it's motivated by a sincere desire to be of service to loyal Pinoy Nokia fans. And that's one of the things that I absolutely love about Nokia; It's a company that cares. So if you're out and about and your Nokia phone runs out of juice, no need to panic. Just head to the nearest Nokia Store and select partner establishments nationwide to charge your phone for free so you can stay constantly connected with all of your contacts, especially your loved ones. You can find Nokia's Free Charging Stations at Abenson, Ayala Cinemas, Eastwood, Medical City, all Nokia Stores nationwide, select Shakey's Pizza Restaurants and SM Malls, Smart and Sun Cellular Experience and Business Centers, Waltermart, and select Wendy's branches.